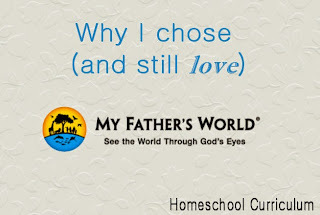 Welcome to searching for a homeschool curriculum! The term "Open and Go" Boxed curriculum comes from the idea that these publishers sell a whole year of subjects all in one package/box. You just open your box and go! 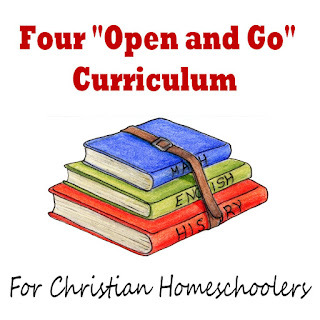 "Open and Go" works well for new and veteran homeschool moms!! 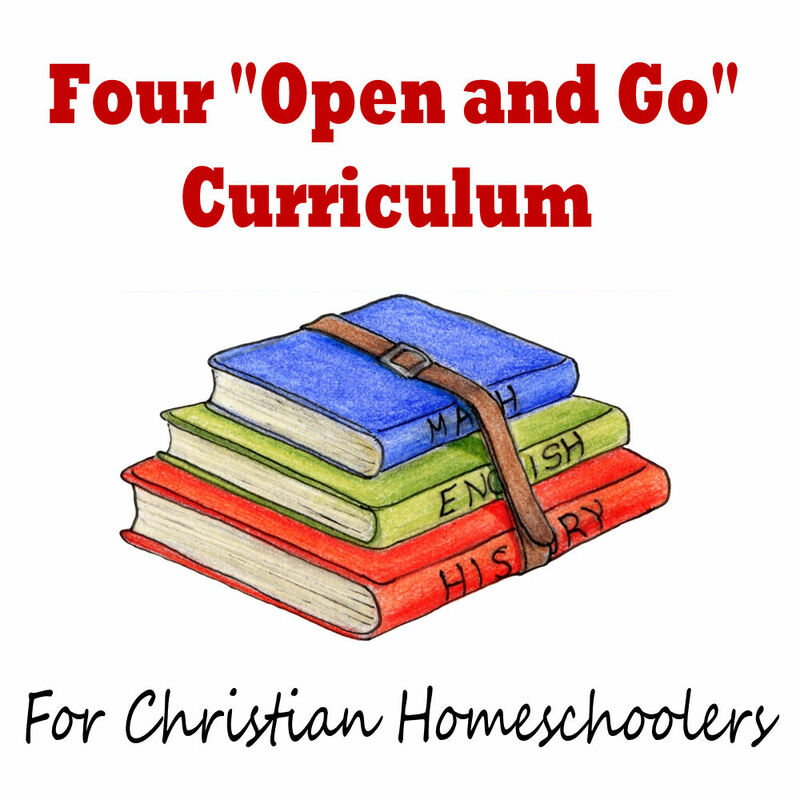 Some think that once you gain confidence in homeschooling, you should abandon the boxed "Open and Go" curriculum, but I highly disagree. I am pretty confident in my homeschooling, but I still love the ease and organization of my Curriculum after five years. The teacher's manual is the main resource in most boxed curriculum, and mine has saved me COUNTLESS HOURS of work trying to align the subjects to make a meaningful unit. For example, a few weeks ago we studied Ancient China. In history we read about the Terra Cotta warriors that guard the emperors' tomb, while in Latin Root Words we read that "terra" means earth/land, and in science we studied that Earth is a terrestrial planet (a derivative of the latin word terra). If I had tried to line all those items up, I would have taken years off my life. As my confidence grows, I am able to adapt it a little more to fit our needs & add supplements, but I still can't imagine not using these wonderful resources. Why not benefit from the YEARS OF WORKS that another homeschool moms spent putting together these wonderful manuals? Take what you can, and leave the rest out! SMALL DISCLAIMER for any boxed curriculum: Remember your teacher's manual is not god. Just because the manual says to do it, doesn't mean your kids will have educational gaps if you leave it out. Our current curriculum, My Father's World, has more than enough to fill our day, and we tend to leave out many items each day, simply because they are redundant to our lifestyle. For example, my kids attend Awana for a Bible Memorization club, so we don't use MFW's Bible memory verses. We survived our first year of homeschooling by studying our family , not just our manual, to know how best to use our curriculum. I asked around in our local Facebook group of 800 women, and below are the four of the the best "Open and go" Christian Boxed curriculum. 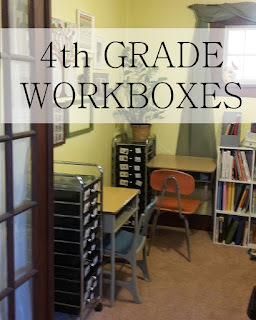 They are in order of costs, including their homeschooling style, link to their site, and some short pros and cons based on the reviews I was given. I haven't researched all of them as thoroughly, but it may be a good starting point for you! Styles-Traditional for the most part. This is not exactly a boxed curriculum, because it is all online, but it fit in the list of an all-in-one curriculum that also has a schedule already laid out for you. No need to add any other subjects, like language arts or math. Very good if your child is going back to public school some day. Online, if you are doing more than one child, you need more than one screen. Very easy to implement, teacher guide very easy layout. You can keep your kids in separate programs or combine close in age them into one (combines up to 4 grade levels with supplements for adding older kids to each grade). 4 day week, with 5th day for catch-up. If you combine more than 2-3 year gap in ages, you have to buy separate supplements packages for older kids. For older grades (above 1st grade) You have to buy and teach Math and Language Arts separately, depending on ages (they have recommendations on their website for those subjects or you could do math & L.A on Easy Peasy free website). Everyone learns together!!! Best for a family teaching several ages together. A multi-age classroom, you teach only ONE geography, science, and history lesson to all your kids, then split off for individual subjects of Language Arts and Math. Structured-Super Easy to follow teacher guide with subjects for the each week. Flexible- Easy to skip activities you don't need or don't fit your child. Example-We made homemade tortillas when learning about Mexico, but never made any of the craftier art projects suggested. We also skip all their Bible memorization because the boys go to Awana. Majority of their profits go to Bible translation around the world. For older grades (above 1st grade) You have to buy and teach Math and Language Arts separately, depending on ages (the have recommendations on their website for those subjects or you could do math & L.A on Easy Peasy free website). You would also have to go to library once every few weeks to pick up books from book list (I see this as a pro, but you may not). Open and go, very easy to implement teacher's guide. All books are included, so no need to ever run to library, or sub a book that isn’t at your library. Not a multi-age program, so you will be teaching four history lessons if you have four children. You have to buy and teach Math and Language Arts separately, depending on ages.